Taco El Sol spent more than a year preparing to open in downtown Spokane. Every August, more than 50 food booths set up shop on the grassy knolls of the Gondola Meadow and pitch tents near the clock tower in Riverfront Park where they stay for several days, feeding some 90,000 people a range of culinary delights from gyros and chicken satay to bulkogi, hot dogs, snow cones and cheesecake. Shortly after Labor Day, when the vendors have packed up their tents, propane and menus, Spokanites are left with a spacious park and a mostly food-truck-barren downtown. According to the Spokane Regional Health District, there are approximately 85 licensed mobile food units in Spokane County. (By contrast, Portland is home to about 450.) These permanently licensed food trucks are spread geographically from the Valley to the South Hill to North Division to downtown. Some obstacles to a vibrant Inland Northwest food truck culture lie in what some vendors say are confusing start-up regulations and costs, in addition to a lack of supportive infrastructure. Five sisters own and operate Fruition: Organic Local Juicery out of a big white truck at the South Perry Street Farmer’s Market on Thursdays. They don’t see downtown Spokane as the hub of a food truck culture. The infrastructure — hook-ups, water sources, electricity — aren’t there and rent for space downtown is a lot higher than in other neighborhoods. The Fragas sisters agree that unless access to water sources and electric outlets improves, food trucks will continue to be found in outlying areas or near seasonal farmer’s markets. But even with a space nailed down, there’s still plenty of work to be done. “We had to learn plumbing and electrical work,” before the truck was ready to go, says Courtney Fragas. Every food truck operation, or “mobile food unit” as they are known at Health District, must submit a permit application. This application must include a list of all foods on the menu as well as preparation plans for each item. The Health District evaluates the risk of the food items and preparation methods. Food truck vendors must also apply for state and city business licenses, receive clearance from the Fire Safety Commission and, depending on the truck’s size, it may require an inspection from Washington State’s Labor and Industries. In all, it can be an onerous amount of paperwork for a prospective culinary entrepreneur. Dave Hayamoto, the business development manager at Spokane Neighborhood Action Programs (SNAP), assists first-time business owners in locating funding and planning their new enterprises. He has worked with those breaking into the food industry and has seen some of their frustration first hand. 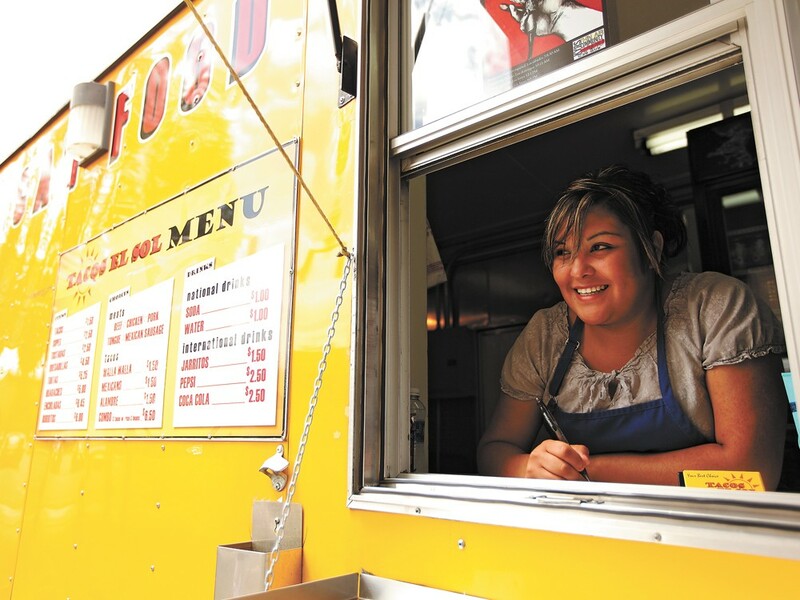 Irma Zuniga and her husband built their own taco truck, Taco El Sol, located downtown at First Avenue and Washington Street, and followed the regulations. Just getting the proper permits in hand took more than a year. But once they had that, they were able to open up shop in a bout a week’s time. The Fragas sisters also reconfigured their Fruition truck. They passed the inspection and were operable within a few weeks’ time. The sisters stressed the importance of organization. Renee Fragas worked on writing and filing the applications. Other sisters worked on the truck. Kimberlee Papich, information officer at the Health District, recommends calling the agency and talking with inspectors about details, and walk through the requirements before purchasing equipment. Entrepreneurs also have to be willing to make sacrifice along the way. Taco El Sol put $50,000 into their business initially and are now able to earn a profit by combining walk-up sales with catering. According to of Taco El Sol’s Zuniga and her daughter, Claudia Escamilla, people are interested in opening up food carts. It’s common for curious customers to ask the two how they went about opening their food cart. And even if you have the money and complete the process of permitting your business, it’s still just that — a business. It’s going to take a lot of work, say the Fragas sisters. They say that owning a food truck is a lifestyle and the truck is the center of that life. Fruition’s start-up costs came to roughly $30,000 and it is too soon for the sisters to predict when their five-week-old business will break even. But for the Fragas sisters, this is a passion project. “This isn’t about becoming millionaires. This is about getting people excited about organic options and providing an alternative,” says Courtney Fragas.